Photo and PDF watermark support center. Please make sure you are using correct version you bought, if you bought Pro version, please download Pro version, if you bought Ultimate version, please download Utlimate version. If you bought PDF watermark program, please don't use Images watermark program. The register name is your Payment Email Address. Please login your Payment Email Address and check inbox or spam folder. Maybe it's there. Send email to us ([email protected]), we will back to you as soon as possible. Double click on your watermark template to open "Edit Watermark Template" dialog. 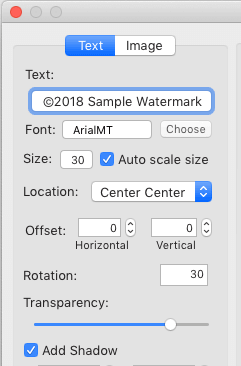 In "Edit Watermark Template" dialog, checked "Repeat to cover image" option to prevent watermark be Removed. In "Edit Watermark Template" dialog, copy this symbol (©) and paste as part of text content. How to start with professional edition? How to start with ultimate edition? Watch Star PDF Watermark for Mac Video Tutorial on YouTube. I don't receive confirmation email including register code. Why invalid register name and code? How to add Text Watermarks to photos and pdf files? How to add Image Watermarks to photos and pdf files? How to auto scale watermark's dimension according to pictures with different dimension? How to modify one layer watermark properties of multiple layers watermark? Windows SmartScreen or User Account Control prevent photo pdf watermark software running? How to prevent Watermark Remover Tools to theft your pictures.